The Casual Cotton headband is designed to turn the bad hair day ponytail into a stylish look. A first I made this headband to compliment my daughter’s Beachside Baby Romper, but after seeing how cute she was in it I decided I wanted one too. I have been wearing my Casual Cotton Headband almost everyday since I first put it on. This headband dresses up my tank top, top knot and jeans look. It makes it look like this busy mom look a little more put together. I have provided two patterns for this headband. They are labeled child’s and adult’s but you can easily make a smaller tie for an adult head band or a large tie for the child’s headband if you like. The only thing that needs to be adjusted for size is the band. Want more patterns like the Casual Cotton Headband? Check out my other free patterns. I decided to use the Bernat Softee Baby Cotton. This yarn is so soft and light for a cotton blend yarn. It is perfect for summer and fall wear. There are a variety of neutral and pastel colors to choose from. I have provided band adjustments so all the girls in the family can have one of these cute headbands. First side of small tie. R8: Ch2, turn, Hdc, Ch2, skip two stitches, Hdc. Repeat Row: Ch2, turn, 3hdc. Repeat this row for the number of times indicated in the sizing section below. 3 months – Repeat for 27 rows. 6 months – Repeat for 30 rows. 12 months – Repeat for 32 rows. Child – Repeat for 37 rows. Teen – Repeat for 40 rows. Adult – Repeat for 45 rows. Second side of small tie. Ch 1 and turn, working down the side of the head band single crochet into the side to give the band a finished edge. Work one single crochet into the side of the first hdc and 2 single crochet into the side of the next hdc. Repeat this all the way around. Then you reach the point, ch2 and turn and work down the other side of the band. Ch1 at the end and slip stitch to the first single crochet. Fasten off and weave in your ends. Take your second tie and fold it in half, weave this through the chain space created in Row 8. Make sure both ties are the same size and use strand of yarn to wrap around the center of the tie several times. Tie a knot and tuck in your ends. Your headband is complete! Time to dress up your updo! R14: Ch2, turn, Hdc2tog, Ch2, skip two stitches, hdc. Repeat Row: Ch2, turn, 4hdc. Take your second tie and fold it in half, weave this through the chain space created in Row 14. Make sure both ties are the same size and use strand of yarn to wrap around the center of the tie several times. Tie a knot and tuck in your ends. Your headband is complete! Time to dress up your updo! 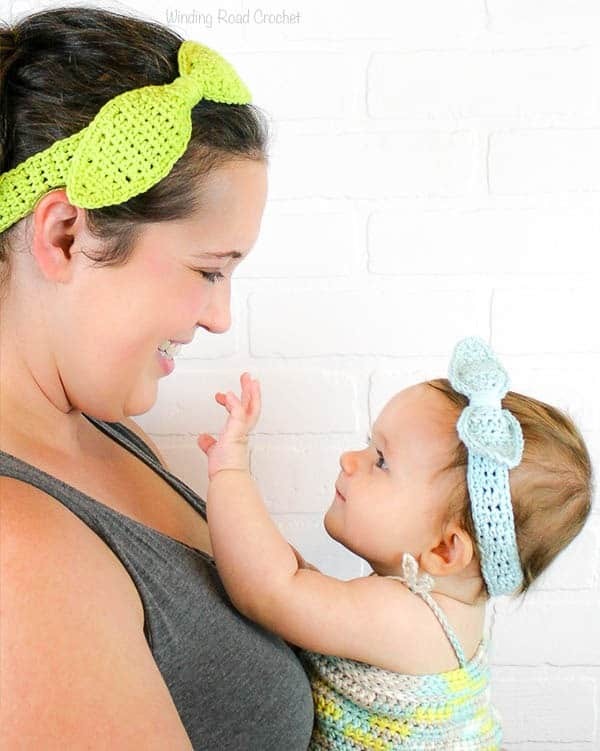 If you make a Casual Cotton Headband, I would LOVE to see a picture! Post it to any social media and tag me @windingroadcrochet or #windingroadcrochet ! I would love to see your work! Check out more of my free crochet patterns!